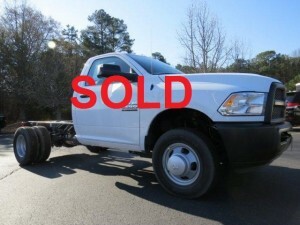 Atlanta Commercial Trucks, a certified Atlanta BusinessLink dealer, is ready to help the Atlanta work force with reduced prices on the last of our still-new 2014 RAM commercial truck models. These amazing and strong work vehicles currently discounted include versatile chassis cabs and a cargo van. The discounted vehicles are in-stock and available for immediate delivery, demo or test drive. These discounts are subject to each model’s availability. Don’t hesitate to act on these great offers from Atlanta Commercial Trucks, the commercial fleet division of Landmark Dodge Chrysler Jeep RAM of Atlanta. 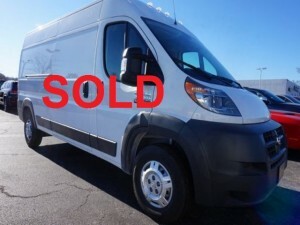 With the ProMaster, Atlanta business owners can find a reliable cargo van with an interior that can be specified to meet your business needs from HVAC to painters to pet grooming and catering. The chassis cabs can be equipped with a variety of upfits to suit any business need — landscaping, refrigeration, mechanics, highway safety, even dump trucks! Please call Atlanta Commercial Trucks and ask for Charlie McCall, Fleet and Commercial Manager, at 678.251.2283 or submit a contact form to learn more about the discounted trucks, upfits, BusinessLink discounts and benefits and more! Have you been looking at the Ford E-series Wagon, Mercedes-Benz Sprinter, Nissan NV Cargo or Chevrolet Express Cargo and need more horsepower, torque, cargo and payload capacity while not giving up any towing capacity or fuel economy? Look no further than the 2014 RAM ProMaster! This commercial cargo van is perfect for plumbing, electrical and HVAC contractors. In addition, we are able to customize the interior of the van to your specifications including locksmith, alarm services, painting, pet grooming/boarding and many other packages. Whether you are looking for an Adrian Steel, Knapheide, Ranger or Sortimo shelving/racks and bins, our local NTEA Certified upfitters have packages in stock. The passenger version is perfect for cab/transportation companies. The ProMaster is extremely capable and flexible for all kinds of business, commercial and fleet needs: standard 62TE six-speed automatic transmission, advanced and durable diesel 3.0-L I4, unsurpassed Powertrain Limited Warranty of 5 years/100,000 miles. Learn more about the RAM ProMaster. This commercial truck is perfect for plumbing, electrical and highway repsonders. In addition, we are able to customize the exterior of your truck to offer such upfits as snowplow, toolbox and even service capsule upfits! Landmark BusinessLink has the durable and dependable heavy-duty pickup that’s great for commercial duties! This truck comes with: 6.7-L turbo diesel I6 Cummins engine, best-in-class payload of 7,390 pounds, best-in-class torque of 865 lb.-ft., best-in-class towing capacity of 30,000 pounds, class-exclusive G56 six-speed manual transmission. Learn more about the RAM 3500. This commercial truck is perfect nearly every trade from delivery to farming to landscaping and more! In addition, we are able to customize the exterior of your truck to offer such upfits as refrigeration, box vans, dumptruck bodies, ambulance upfits and more! Landmark BusinessLink has the durable and dependable heavy-duty pickup that’s great for commercial duties! Found on this chassis cab are: best-in-class 429 lb.-ft. of torque, class-exclusive available Power Take Off (left or right side), 6.7-L turbo diesel I6 Cummins engine, best-in-class maximum towing and maximum GCWR, class-exclusive smart diesel exhaust brake, standard 6-sp auto transmission. Learn more about the RAM 4500 chassis cab. Have you been looking at the Ford F-550 or a Chevrolet Silverado chassis cab and need more horsepower, torque, cargo and payload capacity while not giving up any towing capacity or fuel economy? 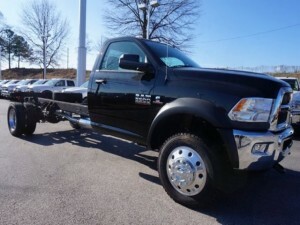 Look no further than the 2014 RAM 5500 chassis cab! Landmark BusinessLink has the durable and dependable heavy-duty pickup that’s great for commercial duties! Equipped with: 6.7-L turbo diesel I6 Cummins engine, best-in-class maximum towing and maximum GCWR, class-exclusive smart diesel exhaust brake, 6-sp auto transmission. At Atlanta Commercial Trucks powered by Landmark Dodge Chrysler Jeep Ram of Atlanta, we help drive your business with work-ready Ram pickups, Ram chassis cabs, vans and more. Landmark is the only Atlanta area Chrysler Dodge Jeep Ram dealer with a sales division dedicated to our business customers. 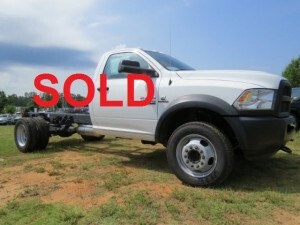 We are the fastest growing Ram commercial dealer in Georgia and the Southeast! We have one of the largest Ram work truck inventories in the state and carry 2500 and 3500 utility trucks as well as 4500 and 5500 chassis cabs. Call us today at 678-251-2283 or come by today at 6850 Mount Zion Blvd. in Morrow, GA. Contact us to order or inquire about our inventory!